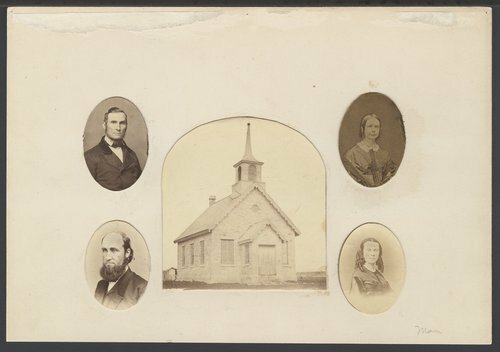 A photograph of the First Congregational Church in Manhattan, Kansas with insets of the first two pastors and their wives. Rev. C. E. Blood started preaching in Manhattan on April 22, 1855 and organized a congregational Church on January 6, 1856. Rev. George A. Beckwith came to the church on January, 1862 and he was installed as pastor on May 26, 1862.